Most anglers spend their entire life in search of a trophy smallmouth bass. Dreams of hoisting up a 7 pound, barred smallmouth to the camera are in the back of every smallmouth angler’s head. With their tendency to travel to deep water and hide behind rock ledges, trophy smallmouth can be a challenge to find. Patterning these fish is only the first step. Ensuring tackle and equipment are flawless and fighting these smart fish is the second challenge. Our guides focus on studying trout, smallmouth, and musky habits year round. Patterning smallmouth can be frustrating some days, which is why we queried two professional guides from Southern Appalachian Anglers to find out more about how to target smallmouth bass in Western North Carolina (WNC) and Tennessee. 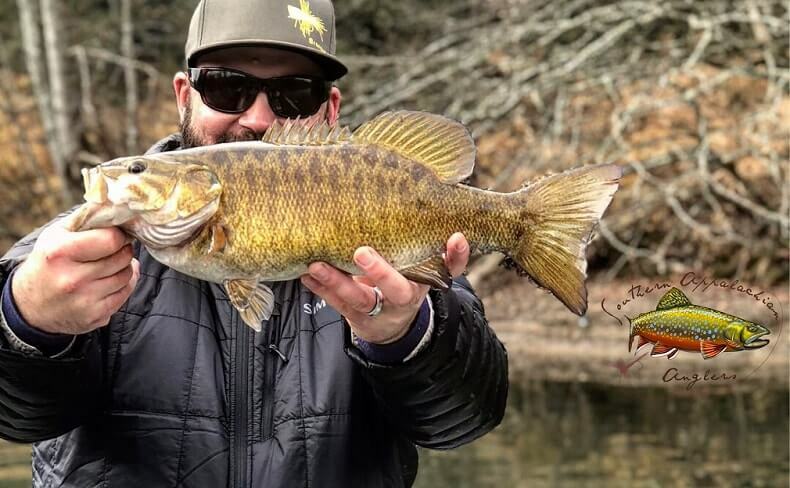 Paul Kisielewski and Ethan Hollifield are veteran anglers who guide in Asheville, NC, and they are certainly not strangers to trophy smallmouth bass. If you are in search of a big bronzeback, take a look at these helpful techniques that may lead you to catch your next trophy. Southern Appalachian Anglers: What water temperature do you target smallmouth bass during the preaseason, and at what temperature do the fish turn off? Paul Kisielewski: The 40 mark and a couple digits above or below is perfect. This exact temp comes and goes pretty quickly, so carry a thermometer. The fish will shut off after they are finished spawning. It typically takes them a week to swing back into a summer pattern. Ethan Hollifield: I typically look for the water temperature to be around 40-42 degrees. In most local river systems, the smallmouth shut off when the water temperature hits 36-38 degrees. Southern Appalachian Anglers: Where do smallmouth spawn in rivers? Paul Kisielewski: Smallmouth prefer a hard bottom with small rocks, a sandy bottom, or areas behind current breaks. Ethan Hollifield: Smallmouth tend to spawn in the tail outs of pools or behind cover along the banks; they prefer areas where the bottom is free of silt and relatively sandy. Southern Appalachian Anglers: What type of cover do smallmouth use to stage right before the spawn? Paul Kisielewski: Depends on the river, but any type of cover that is close to deep water is where the trophy fish are. Sometimes the bigger fish can be found searching for bait in flats and behind shelves. Ethan Hollifield: Cover can vary from river systems depending on what the bed load of a river system consists of. I generally look for deep shelf areas that transition into shallow shelf areas where the bass can move easily from deep water to shallow water. Southern Appalachian Anglers: Baits, flies, and other technical equipment you recommend for anglers pursuing trophy smallmouth? Paul Kisielewski: For your fly rod set up, use a 7-9 weight. Using anything lighter will cause the fish to fight too hard and potentially harm them. I prefer 10-12 pound monofilament or flourocarbon. Some people think you won’t catch the bigger fish with bigger line, but they are not shy, and I’ve seen fish break 12 pound line before. For flies, use articulated baitfish patterns or crawfish patterns. Make sure to change color throughout the day, for they can be picky. Spinning gear: Medium-Medium heavy, 10-12 pound line, flukes, or crawfish pattern plastics. Ethan Hollifield: When using a fly rod, don’t go lighter than a 7 weight. Fish aren’t going to be leader shy typically during the prespawn, and it’s not fair to fight them on really light tippet. Flies: dredging jig patterns that imitate crawfish or large articulated streamer patterns. Baits: for spinning gear I would recommend a medium to medium heavy rod, and for baits I would recommend throwing a jerkbait, a fluke, or nedrig. Southern Appalachian Anglers: How does a drought affect the spawn? Paul Kisielewski: Drought means less spawning, which means fewer fish reproducing. If there’s a flood or just high water flows that time of year, it will improve the fishing later that season. Ethan Hollifield: Droughts can be detrimental to spawning patterns due to the lower levels of dissolved oxygen, along with the shallower water inhibiting smallmouth from reaching prime spawning areas of a river. It could also lower the survival rate of smallmouth frye and affect a female smallmouth’s ability to lay a normal number of eggs. Southern Appalachian Anglers: Presentations you use for preseason fish? Paul Kisielewski: I like to use hair jigs. I hand pour and tie two sizes to find where the fish are staging. I prefer to throw a 5/8 oz. and 3/8 oz. this time of year. Ethan Hollifield: Smallmouth are coming out of the winter lull, and the bigger females are wanting to pack on weight for the spawn. They are going to be aggressive, so don’t be afraid to look for reaction strikes off of ambush points such as lay downs, deep shelves, and transition zones. Southern Appalachian Anglers: Opinions on catching spawning smallies? Paul Kisielewski: I don’t mess with spawning smallmouth. Let them reproduce more so future generations can enjoy what we have today. If you see a male guarding a bed, just pass him and let him do this thing. Ethan Hollifield: This topic is somewhat controversial. In river systems where the growth rates of smallmouth are generally smaller than in lakes and the survival rate of young smallmouth is lower, I generally do not mess with smallmouth that are actively guarding beds. This is to ensure a healthy and sustainable fish population, which is vital for the health of a river system in its entirety. Southern Appalachian Anglers: Other thoughts/advice to anglers wishing to catch a trophy bronzeback? Paul Kisielewski: Do your research. Don’t expect to go fishing and catch 40 smallmouth every time you go out. Explore, study, and repeat. The only way to really pattern smallmouth or other species is to put in the time. Ethan Hollifield: Trophy smallmouth are comparable to large trophy brown trouts in their cunning and tenacity . These fish are well educated, and more often than not, they have seen a wide variety of baits and flies thrown at them throughout their lifetime. Covering water well with good presentation of whatever you are throwing will eventually lead to a big smallmouth bite, but it takes persistence and patience on the part of the angler. Southern Appalachian Anglers offers smallmouth bass guide trips from late February – early December. Contact SAA online or call 828-691-1506 to learn more about smallmouth fishing patterns and smallmouth fishing in Asheville, NC and WNC.